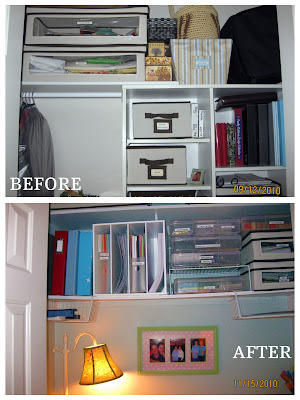 IHeart Organizing: Reader Space: "Cloffice Insperation?" 19 Reader Space: "Cloffice Insperation?" Anyway, those words were created because the following stories aren't just about any typical desks.... 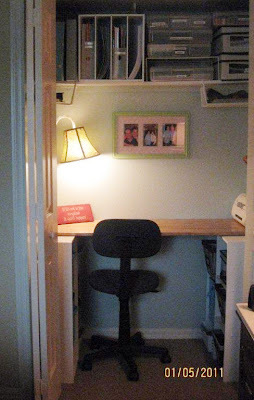 They are desks built into closets. My FAVORITE!! This is my personal haven. My "mom cave" if you will. But what is REALLY cool about this space, is that it has inspired some to do the same in their own homes! How sweet is that?! With your inspiration, I converted my extra closet into a scrapbooking room! I love it! Thanks so much for sharing all your ideas. But when she was done with it, it was a totally different and functional zone! Look at all that STORAGE! Bins, bins and more bins, all at easy reach! Plenty of workspace. A printer. Lighting. Personalization. It's ALL there! 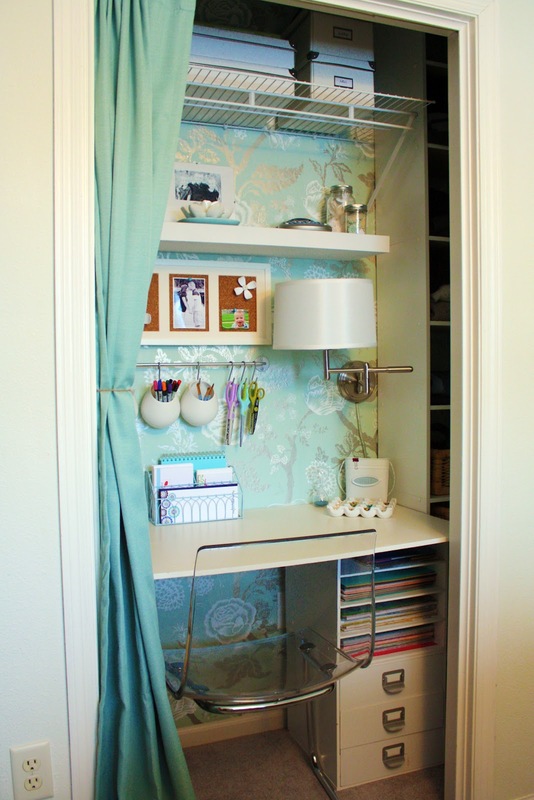 Who knew that a closet could seriously transform into a whole room? When you think about it, that's what you are doing. Many people have entire rooms dedicated to the "office", however, for many, that's also not an option! 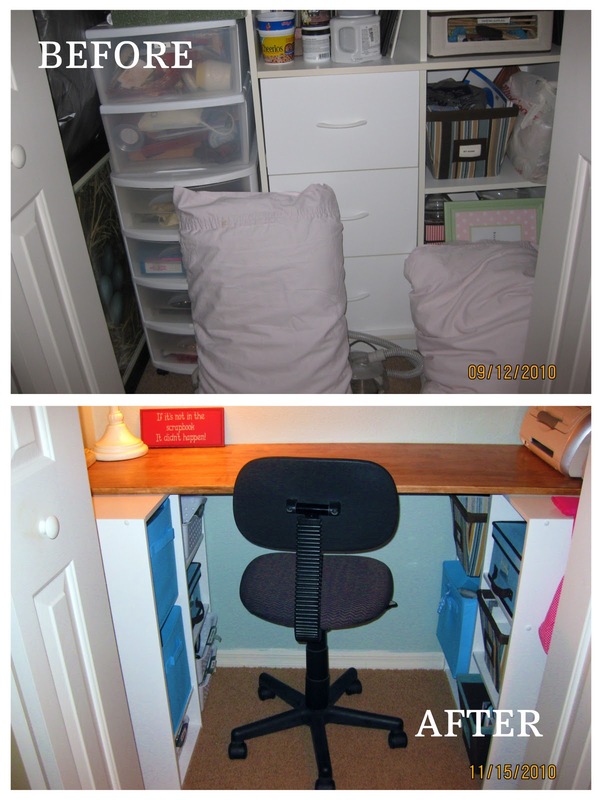 This is a great space saving solution! But wait! I have another example! I recently discovered your blog and am loving it! I am not much of an "organizer" by nature but slowly I"m getting there. 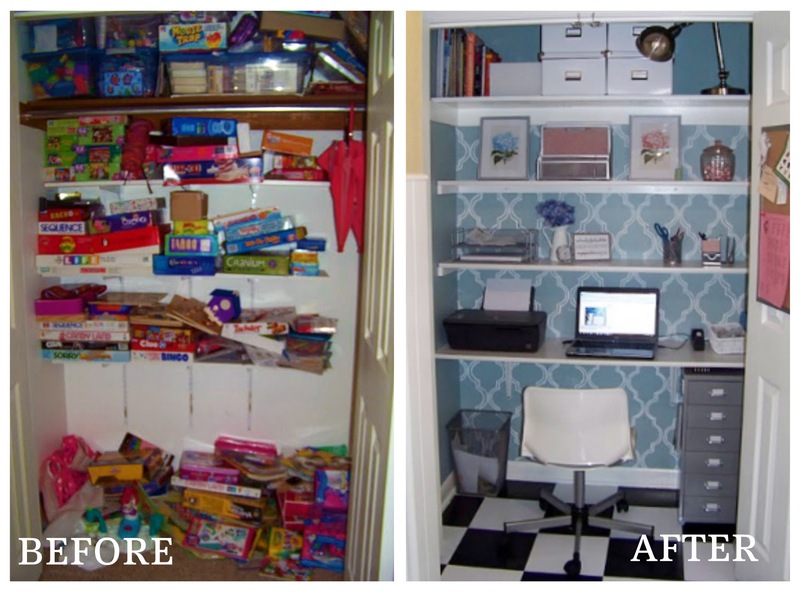 I was inspired to turn our game closet into a "cloffice" recently and your challenge on Paper Clutter was perfect! Here is my blog post on it, I hope you don't mind, I linked your blog up! Thanks for all the inspiration and awesome ideas!!!!! I've told a gazillion friends about your blog! Who doesn't just L O V E that stencil job she did on the wall!! Way to save some moola on the pricey investment that is wallpaper and making something fabulous out of paint! It really is amazing! 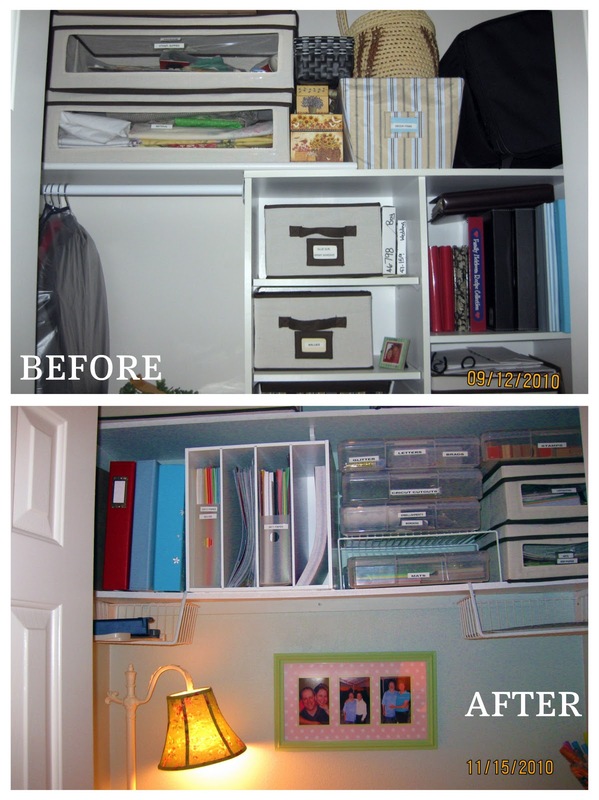 And again, because in a closet you have the option to go vertical with storage, there is so much potential! This is another example where that was taken advantage of and completely successful! Lets do a little dance for these ambitious ladies and their new spaces! And take a look one more time at the incredible side by side before and afters! P.S. Have an awesome organizing story to share? I am looking for projects that have made a positive impact to your life. Please send your story and photos to iheartorganizing@gmail.com and I would heart to feature them right here, on the blog!! Photos should be high resolution and un-editted. Please include a description of the project, including any costs, inspiration, and how it has changed your routine for the better is so helpful! Oh, and no worries my friends, we will NEVER judge "before" pictures because that just wouldn't be nice! Only love goes on at this blog! Those are just fantastic. How exciting to have inspired others to make such a great space for themselves. Have a great day! Weirdly enough, when I saw the title of this post I thought of "cloffice" as something to do with office claustrophobia and "deskperation" as exasperation or desperation with one's desk...weird how the mind works, isn't it? Love the makeovers! These ladies must feel so great to have organization under control again. And I meant to tell you a while back, I saw a picture of your cloffice in a magazine. For the life of me I can't think which one. I will look and get back to you soon. Sorry! That is so awesome!! I thinking about doing something similar to that in the kids playroom. The closet in there is HUGE but right now it houses their toys & games. How awesome are those cloffices, I just love their creative knacks! Thanks for sharing. Ok you would laugh if you saw what my husband and I turned one of our closets into! I'll send a photograph.. but oh man.... we're "special!" I so want to do this but am waiting for some carpentry help as well as a little bit of money. But I can't wait! I get all giddy when I think of it! Cloffice i sort of get. But deskperation sounds like you aare feeling desperate about your desk, not inspired by it, and organizasperation sounds like you are getting exasperated because you can't get organised! I love your kickback to your readers. Nothing more sweet than paying if forward. See what you started? Love your inspiration! Oh and I'm a new follower. See you tomorrow! What can I say... maybe I am not the best at making up words! Guess I will just stick to organizing. It was fun anyway! 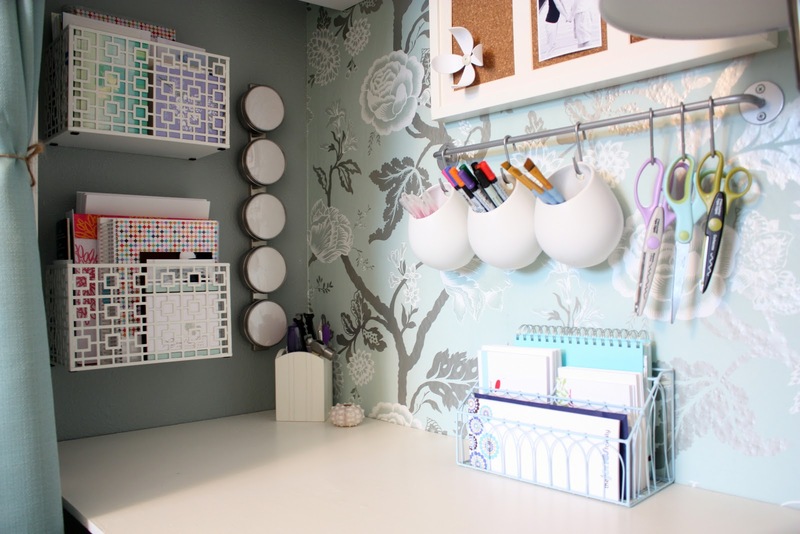 I love you blog and Love Love Love that there is someone else out there who loves organizing as much as me! I can finally tell ol hubby there are others out there! However, your closets are much cuter than mine....mine are organized but yours are so FANCY! I am a new follower and giving you a shout out on my blog today!!! You have have inspired me to get my office space organized so the hubby and I have been doing some reinventing of our space. Where can I send pics to show you!?! Send the pics on over to iheartorganizing@gmail.com! You inspired me so... I did it! I wrote a blog post about it and I mentioned this post. Just thought you'd like to know! This is wonderful! I have an extra closet in my hallway that's currently being used to store JUNK. This has definitely inspired me to do something with it! Thanks! !